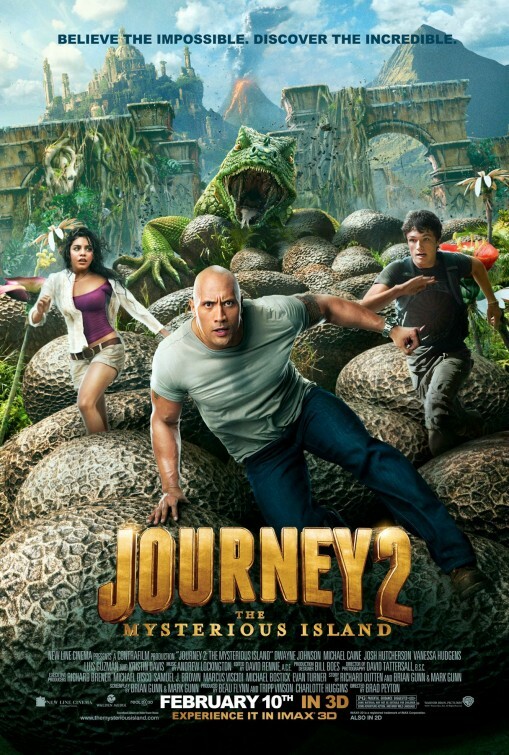 Check out the new poster and trailer debut for JOURNEY 2: THE MYSTERIOUS ISLAND, the sequel to the 2008 hit. The film stars Josh Hutcherson as the young adventurer Sean, Dwayne "The Rock" Johnson as his new stepfather, Luis Guzman is the goofy helicopter pilot and Vanessa Hudgens plays his strong willed daughter and we get an appearance from Michael Caine who plays Sean's grandfather. The movie hits theaters in 3D on February 10th, 2012. Sean receives a coded distress signal from a mysterious island where no island should exist--a place of strange life forms, mountains of gold, deadly volcanoes, and more than one astonishing secret. The small group set out to find the island, rescue its lone inhabitant and escape before seismic shockwaves force the island under the sea and bury its treasures forever.